I know so many of you are dealing with much colder...much damper. and pull the down blanket around me tighter. Cold hurts in the land of sun. never have enough warm clothes. So....I use the down blanket. I love the style in each one of these rooms. It's so warm here, come west, Linda, come west!! I'd even settle for 25 oC. It's a deal?? I would much rather be in one of those gorgeous rooms than here in the FREEZING midwest!! Can't wait for the warmth!!! This time it is the bookshelves surrounding the doorway. LOVE it. Oh I LOVE all of the blue. These pictures are like looking at heaven! 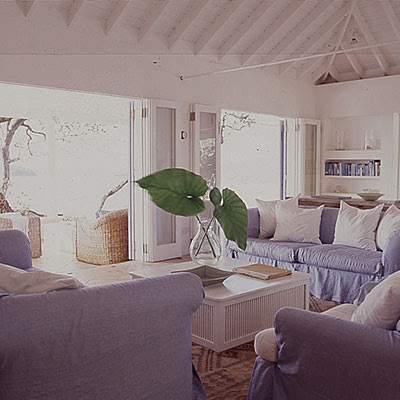 love those breezy-looking rooms. . .
Hmmm...looks nutritiously warm and relaxing...that season is almost here. No need to hear the swank call of summer - yet. Nor the heady notes of a Rush in the green...the soft metalic tings of dry snow on small limbs is enough for now...now is a good time to see possibilty in others postings and just smile. Lovely interiors! I'm wearing shorts and my furry slippers today here in AZ! HEE! 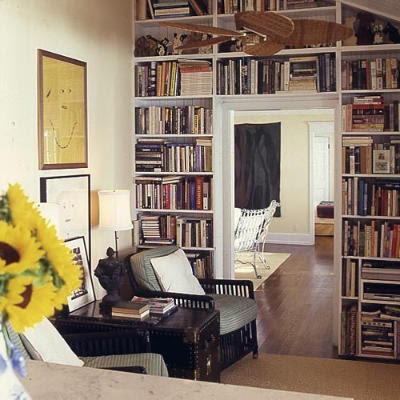 My favorite pic is of the bookcase surrounding the doorway. That, to me, says cozy and lazy, wrapped up in a warm blanket and a hot toddy! I hope you were able to bundle up today! Yes you are right at least us up north we are prepared for the cold. I hope the sun warms you up soon my friend! 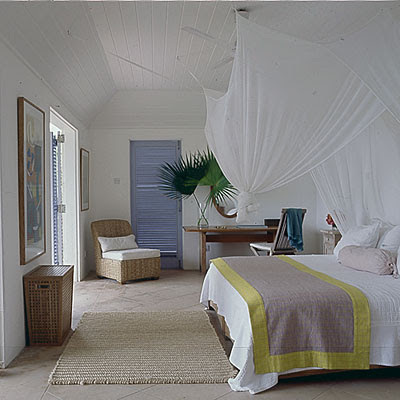 Beautiful breezy rooms. Oh yeah, it's cold alright. I'll send you some of our snow. LOL! Would much rather be down your way. 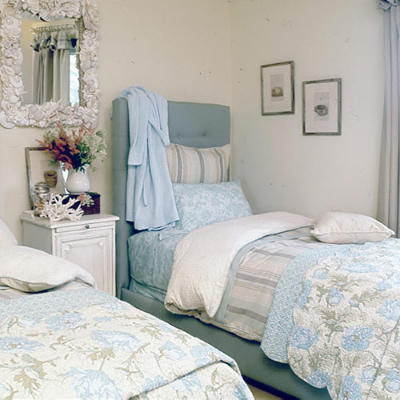 I LOVE the twin size headboards and the mirror, are those shells? just love it. I hope it comes soon! I just love coming to see your blog. It is full of warmth in itself. Thanks...I needed it. It has been a little chilly here in Florida. I had my comforter up around my nose the last few nights. Wind and rain just blew through here and it got colder. I just can't find it in me to turn on the heat. What's that they say about your blood getting thinner? Always thought it was a wives tale. But now, not so much. what a fresh look- I will be back often to soak in the goodness. Here up in the cold north of Scandinavia I just wait for the sun and the warmth to return. Every evening I,m sitting in my sofa with the blankett around me and the candles lightening. I love the cozy corner in the first picture. Lovely! Honestly? I kinda love the change...as long as palms don't die. Karlene....yep, those are shells around the mirror! Thanks for all of your great comments. makes me warmer. Kinda. Sorta. I hope so! Those are such fabulous rooms! Nice spaces...they look so inviting and relaxing. The hint of Robins Egg Blue and the other colors combined with the white rooms is lovely and inviting. Oh you weren't whining Linda!! You were right.. it WAS cold!!! Brr... our old house just couldn't get warm enough! And I can never find my slippers either when I need them! Lucky me...it's summer here in Australia! Love these easy breezy pictures, especially number one - I could definitely curl up under that window with a good book! Linda! you always find the best pictures! Im in love with the daybed in the corner by the fireplace. I need a corner like that dang it!!! I so relaxed after looking at this post...such beautiful rooms!